When it comes to casual wear, I'm more of classic foolproof pieces that are easily combinable and never go out of style. I've already showed the style I turn to when going to the office, but what I wear during a casual weekend is a whole different story, and even though I enjoy dressing up with my most elegant and formal pieces every once in a while, I generally choose those that make me feel comfortable all day with a minimalistic class: my weekend staples. 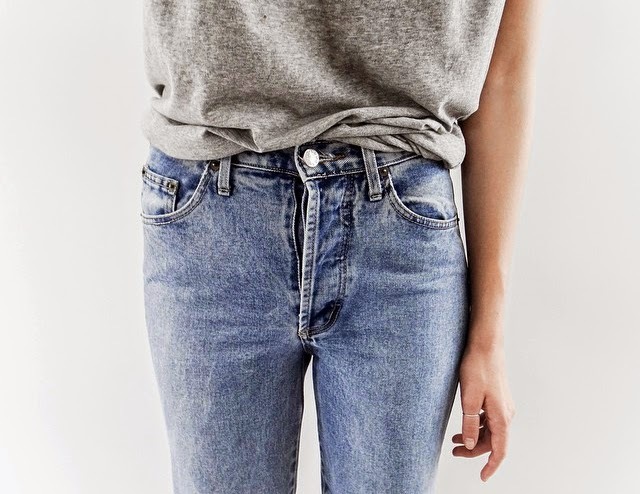 For me, the perfect pair of blue jeans and a loose white or gray t-shirt is my favorite combination. I love the effortless vibe to it, and whether I combine it with heels or flats, it never lets me down. A good pair of jeans and a well-loved tee are those investment pieces we all need in our closet, and if we're lucky enough to have them both fit perfectly, it instantly becomes classic staple outfit. Adding an oversized sweater during chillier days makes me feel even more comfortable and in style at the same time. Image from la cool & chic, grey & scout, and ithaa.